I use Winamp (classic) for ages in Windows. Now that I start embarking into Puppy world, I'd like to keep as many 'familiar' apps as possible. In my research, I found one of the ways is to have Wine installed. So, I research about Wine (didn't know what wine was until I did some reading... didn't think it was the red or white kind of wine). So many variety of Wine out there. I downloaded the 'latest' found, v3.0 failed to install. Also found Mike's old posting. I'm hoping more experience fellow Puppy users here can give me some guidance. Like what version is 'best' and where to get it (too many out there, hoping to cut the trial error time). FYI - I probably will use FATDOG64 v721 as my main puppy, although I have few flavour of puppy installed. Still exploring. After posting, I realised it should be in GSAPT or PPM. Will post later if need assistance. I'll state, here & now, that I have no experience of FatDog. At all. In my 64-bit Pups, I've first installed the 32-bit_compatibility_libs SFS package.....followed by installing a 32-bit version of WINE. Winamp will then simply install from its .exe file. There are now 64-bit WINE Puppy packages, but I've no idea how you use these. Again, no experience. I do know extra jiggery-pokery is involved. I do know this much; if you want to run XP-era apps, you're better off with older versions. I rather suspect that since Windows uses newer & newer dlls all the time (and MyCrudSoft have long-since dropped support for XP itself), that this is partly why I find that many of my apps don't run so well with 'new', 3-series WINE. 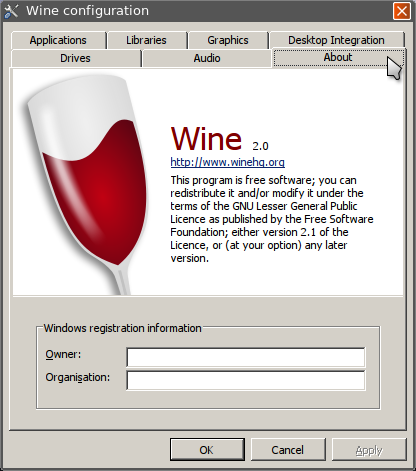 WINE, itself, is based on Windows. Q.E.D. I almost always use version2013's WINE 1.7.51 (quite an old version, it's true).....but for my particular set of Windoze apps, it works perfectly. You need to experiment, essentially. There's scores of versions readily-available. Try 'em out; find the one that works, the greatest part of the time, with the largest number of your particular Windows apps.....then stick with it. Tried it on Fatdog64 and UpupBB. Installed wine (v3.0) from GsApt / PPM (respectively), both no errors. Watched some youtube video about this topic, they seem to be able to click on the app to be installed. For Fatdog-721 just run the sfs manager from control panel (or type "sfsmanager" in a terminal window) and download one of the available wine versions. Sfs manager can arrange to permanently load the sfs file (click System SFS Loader), which makes wine available all the time. Alternatively, you can load the sfs file when you need it and unload it afterwards. Right click the file icon and choose "load" or "unload" as appropriate. After tinkering all day, I managed to install wine v1.x in XenPup, so that gave me some idea of how it works, i.e. I can run Winamp now in XenPup. But in Fatdog, I could not get it working, even after loading anyone of the SFS downloaded thru the SFSManager. I can see the SFS files, I can see they are loaded (thru SFSLoader and also it says load successful when loaded). Either it's not working or I don't know how to use it. I was expecting that it will work similar to in XenPup, ie. I managed to install Winamp by prefix wine i.e "wine winamp.exe". In terminal, got error "sh: wine: command not found" for any wine command that I executed. Exactly the same behavior when I installed wine thru GsApt this morning. BTW - I uninstalled what was installed thru GsApt before I tried SFS way. Maybe I'm still missing some more modules/libraries? I use XMPlay with a very old WINE version. No experiense with Fatdog though. BTW - VLC (which has a linux version so you don't need WINE) is actually a very good video and audio player with excellent effects (equalizer, etc. is very effective and powerful). Yes, VLC is actually 'built-in' in Fatdog64. Wine got my interest for the moment. I don't expect it to be perfect. Atm, the only way I know to make it visible again is by killing it and rerun the app. For the moment - just trying to build/find a 'perfect' puppy for my use. And build up my knowledge along the way. I downloaded 3 wine sfs, v1.x, v2.x, v3.x. Skip v1, too old, I'm not sure how well it works for Fatdog-721, which is recents. You can read how to use wine at winehq.org. It will save you a lot of tinkering. You didn't say this, but let's make it clear that you can only load one of those SFS files at the time, never together. Also, you must not install any wine package at the same time a wine sfs is loaded. Other Fatdog users, including me, successfully use the wine sfs. Using them is very easy, just type wine /path/to/a/windows/32bit/exe/file. Note that it has to be 32 bit. If it's 64 bit you can still use it with v2 and v3 wine sfs, but the command is different, I think something like WINEARCH=64 wine /path/to/... but I can't be sure. Check this on winehq.org. Be wary that the first time wine runs on a system it creates a folder /root/.wine, named the "prefix" WINEPREFIX, which is 32-bit or 64-bit dependent. You can't mix a 32-bit prefix with 64-bit Windows executables. Read more on winehq.org. I suspect your Fatdog64 save file (or save folder) is messed up from previous wine experiments. Right. Uninstalling isn't enough when you mix different package sources and methods. Make sure to remove /root/.wine at the very least. The "not found" message could depend on a dangling symlink, if the wine sfs is actually loaded. Anyway, rid your save file/folder of any wine debris, reboot and try again loading the wine SFS. You can convince yourself that wine sfs works by booting Fatdog without a savefile (it's a boot option), using SFS manager to download a wine sfs, and loading it to run winamp. Make sure to put relevant files to locations on your HDD that are outside the Fatdog save file/folder. No, the wine sfs files are self-contained and work on Fatdog-720 and 721. One more thing. Post your Fatdog64 support questions to the Fatdog64 support thread (in my signature) to receive more attention from Fatdog users who could answer your questions. Aside from step's detailed & helpful response, there is one thing that many WINE posts here on the Forum never, ever seem to mention. And it's not helped by the fact that a lot of the available installs don't add Menu entries, either. .....in the terminal. What this does is to create and set-up the hidden '.wine' folder in /root. This is your Windoze 'virtual environment', from where your programs/apps will work. Personally, I have a 'MenuEntry' I've made up for this very purpose. I install that first, so it's sitting there ready, waiting. I install WINE, then I click on the Menu entry, and it performs its magic. You'll usually be asked if you want to install MONO (the WINE Project's version of the .NET framework), and Gecko (which enables HTML rendering within WINE). OK both of these, because things won't function properly unless you do. I've attached the 'WINE CFG' Menu entry .pet below if you wish to avail yourself of it. After install, you'll find it under Menu->System.